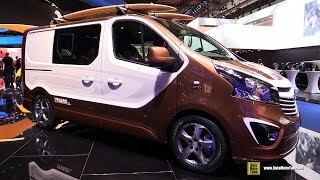 At the Frankfurt Motor Show 2015, Vauxhall introduced its all new Vauxhall Vivaro Surf Concept 2016. The model not only offers lots of space that can captivate six people comfortably but also has a touch of sportiness and luxury that will catch all the eyeballs while you are rolling this thunderous yet gentle roller down the lane. Let us have a look at the review of Vauxhall Vivaro Surf Concept 2016 to know more about its specifications and performance figures. The interior of Vauxhall Vivaro Surf Concept 2016 is a commendable blend of technology and space. The model comes with keyless entry and start and also has a kicking motion feature to open and close the tailgate. The rear seats can also be folded to increase the cargo space while the comfortable seats are covered with smooth leather that features luxurious looks and offers a comfortable seating. Talking about the connectivity the interior comes adorned with OnStar high-speed 4G LTE mobile network connectivity, which notifies you keeping the vehicle continuously traced in case it gets stolen. Not only this it also has the Apple CarPlay and Android Auto which are linked with the new version of IntelliLink infotainment system. 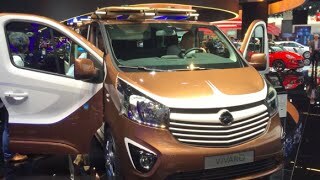 The exterior of Vauxhall Vivaro Surf Concept 2016 is truly amazing carrying the instincts of interior. It has muscular blend with the touch of elegance that portrays the design philosophy of ‘Sculptural Artistry’. The front fascia has wide elongated headlamps beside the traditional grille while the bumper comes with a long air vent in middle and the sides have wide fog lamps that splatter aggression. The rear has features that you can expect from any model like this. The flat rear end has vertical taillamps with integrated brake lights and a metallic touch beneath the rear window. 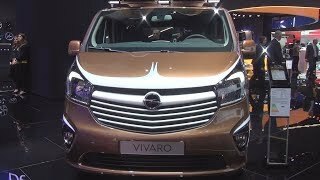 Rounding up the exterior details of Vauxhall Vivaro Surf Concept 2016 I would say the model is well designed keeping in mind to portray sportive looks without compromising with the essence of luxury. 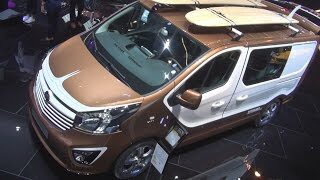 Beneath the hood of Vauxhall Vivaro Surf Concept 2016 is a 1.6 liter CDTi generating total output of 138 hp and peak torque of 340 nm. 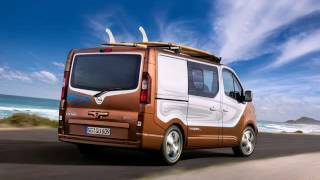 The power so generated can take the top speed of Vauxhall Vivaro Surf Concept 2016 to 112 mph.